America - what they do today we do tomorrow. It was just as true 30 plus years ago. In America the Ford Mustang had become a much loved and sought after car - could Fords achieve this in Europe? Not with the Mustang as it was too big and American for our European roadways and tastes. So to the drawing board to design the car that was to become a much loved coupe through out the world but especially here in Britain. 1965 design studio's begin work on drawing the colt - son of mustang, they made several versions in full size dummy models to assess. They were assessed for aerodynamics but it was really just the starting point for deciding future development. The final model chosen was not he best in terms of aerodynamics they chose an American version as it best fitted the criteria laid down that the car should be a match of sports and GT. Fords were acutely aware that the public will make or break a product so they took note of market research and to this end showed two designs to a carefully selected cross section of the public - one design named Flow line, and one named GBX. The public were not told who the manufactures were so could bring no bias to bear on the outcome, they were asked to choose the best for styling in comparison to other designs and other sports cars. The outcome was favourable so Ford's decided to move on further with the project. The car had to be appealing despite less interior space and luggage space and with only two doors. It also had to be pitched at a competitive price so production costs had to be thoroughly investigated. July 14 1966 is a date few people know about, what is it's importance? Well it is the date that the Ford management meeting in Britain gave the go ahead for the project to be given the green light. The first working prototypes were put together in 1966. 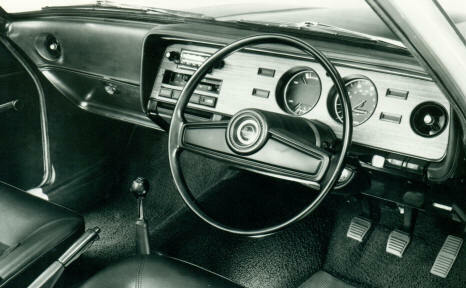 October 1967 The colt rear windows were dumped in favour of U shape side windows. prototypes were already being tested but rear seat passengers were complaining of feeling claustrophobic, the side windows needed to be modified to give a more spacious feeling. The Japanese held the copyright of 'Colt' so a new name had to be found - enter Capri. November 1968 Manufacture begins at both British and German factories. January 1969 Official Debut at the Brussels Motor Show. A wrap hid the Capri from view until the appointed official time, when it was removed there stood a gleaming white Capri, the gasps from the assembly of press reporters etc said it all - here was a car with a big big future. There is video available showing the unveiling. March 1969 The 2000GT made for the UK market and fitted with a V4 engine. March 1970 Top of the range 3000E goes on sale. Executive meant the car had vinyl roof, cloth inserts seats (no more executive burnt bums) and opening rear windows. September 1970 Improved lighting and power assisted brakes as standard across the range. September 1971 The first Special Edition, the Vista Orange Special, 2000GT with bright orange paint and Mustang type dress up by way of louvers for the rear screen and a boot spoiler. October 1971 3000GT engine modifications to give increased power. Re-shaped inlet ports and larger inlet valves with hotter camshaft, larger jets in the twin choke carburettors and tubular exhaust manifolds. New gearbox ratios , softer rear suspension and to stop all this extra thrust - improved brakes. The 2nd Capri special was available for collection in June 1972 - it was a limited production intended to use the Prefacelift bodies but it also incorporated a few of the designs that were later seen on the facelift model, things like the indicators in the side of the wings and the bonnet bulge. They were only available in 1600GT, 2000GT 3000GT. colours were either Lt Emerald Green with gold coach line or Ebony black with red coach line. January 1974 Manufacture of RS3,1 limited run projected of 1000 cars for group 2 racing. Added spoilers front and rear and bored out Essex V6 engine. March 1975 Capri S codenamed 'midnight' in black livery with gold alloy wheels and gold coach lines and gold/black interior, commonly became known as the 'JPS' Capri but were also available in white. October 1975 The S is produced with a choice of 2lt or 3lt engine. 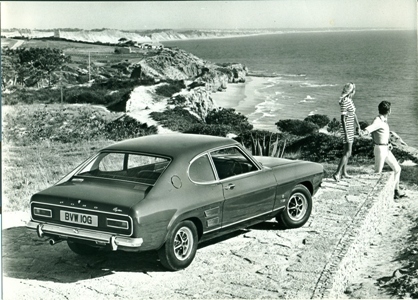 October 1976 Production of the Capri ends in Britain, all Capri's now to built in Germany. March 1981 2.8i - petrol injection and V6 ventilated front discs from Granada . New suspension and alloy wheels plus new interior trim. January 1983 Five speed gearbox fitted to 2.8i . November 1983 Tickford introduce Turbo power to the 2.8, rear disc brakes and limited slip differential , luxury interior and body styling kit. June 1986 Turbo Technics announce the modification for the 2.8 engine. 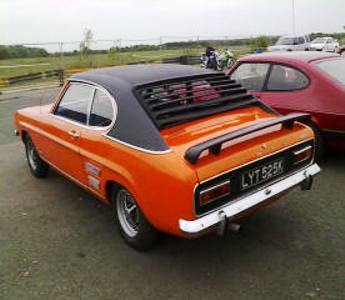 THIS Capri was amongst the most exciting Capri’s of the early 1970’s, along with the RS2600, RS3100, Commanche 190, Atlard V8, Lumo Capri and Perana Capri (the last four modified by specialized firms). It’s called the Broadspeed Bullit. It was first available in early 1970. Based on either a 3000E, 3000 GT and also a 1600 GT. As Broadspeed was a Ford dealer they could price the Bullit competitively with the standard range. These were the prices for a 1971: £1995 for the 3000E, 3000GT was £1825 and £1575 for the 1600 GT. The Bullit was definitely not a kit because you could only buy the Bullit as a complete car.